If you are looking for a FUN, light hearted, clean summer read please look no further. Miss Buncle's Book is nothing but pure delight. A friend recommended this read for my Kindle (for the aforementioned oversees trip) and it looked curiously engaging. I purchased it for the Kindle and loved it so much that I'm going to turn right around and buy a hard copy of this first title and the subsequent titles in this series by D.E. Stevenson. 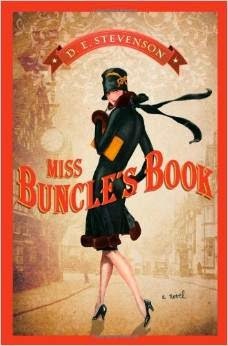 Miss Buncle's Book was first published in 1934 and did well enough to be followed by a sequel in 1936 (Miss Buncle Married). It was written by Dorothy Emily Stevenson who had loved writing ever since she was a young girl. Educated at home, young Dorothy discovered that she loved writing as early as the age of eight. However, neither her parents or her governess approved of this habit of hers and so she practiced without their knowledge. It's hard to believe that her family disapproved of writing. I don't think they should have been terribly surprised by her desire to write though as the habit ran in the family. Her father's first cousin was none other than Robert Louis Stevenson! I'm glad Dorothy Stevenson was naughty enough to work against her parents' displeasure in this because what she produced is quite entertaining. As mentioned, Stevenson plugged on with her writing, eventually having a book of poetry published in 1915. She married in 1916 and her first novel was published in 1923. The first novel was something of a flop but the second met with better success which kept her at her work. All told, she wrote over 40 books, the last being published in 1970, three years before her death. She spent her whole life writing and I will spend the rest of mine reading what she wrote! It looks as if most of her books are out of print but, gratefully, the Miss Buncle ones are back in circulation. Miss Buncle is the main character in this title. She is a quiet, unassuming single gal who lives in a remote country village in the English countryside. Bored with life and in need of money, she makes a desperate attempt to earn some cash by writing a book. However, she doesn't fancy herself being able to make anything up out of thin air and so she writes about what she knows - the town in which she lives. Miss Buncle changes the names of the characters to protect the innocent (or, perhaps, the guilty!). Miss Buncle's book meets with instant success but the citizens in her local village are not at all happy about it. They are instantly (and correctly) convinced that the book is about them but they do not know which person in their town wrote it, as Miss Buncle wrote under a pseudonym. The entire book is about the townsfolk's disgust and displeasure over the book and describes their hunt to root out the author. It's a simple plot, but a fun one. Stevenson gave the people in the village quite the personalities and the chaos which ensues post publication of Miss Buncle's book as a result of their personalities is quite hilarious. I highly recommend this read to you. I think you will enjoy it. I know I certainly did and truly can't wait to get my hands on more of Stevenson's writings. Excellent suggestion from my friend! I now pass it along to you. A fun synchronicity: I took The Two Mrs. Abbotts with me to the dentist. As I sat in the chair I thought about how few "dentist scenes" are in novels. After the cleaning, while I waited for the dentist, I pulled out my book and read the last chapter: "The Dentist's Waiting Room"! Thanks for your review. I liked the biographical bits. Isn't it fun to read reviews of books you've recently read? Yay! I love D. E. Stevenson. I've read a number of her books and own a few. You should read Miss Buncle Married next. It's also good. The following two books after that (there are four total) are more loosely connected, but still very good. I didn't care much for Rochester's Wife or Gerald and Elizabeth. YAY! I'm so glad you loved it!!! If you read it, let me know! !